Irvine, Calif. (January 20, 2014) – Round 3 of Monster Energy Supercross returned to Angel Stadium in Anaheim to celebrate the 40th Anniversary of the sport on Saturday. 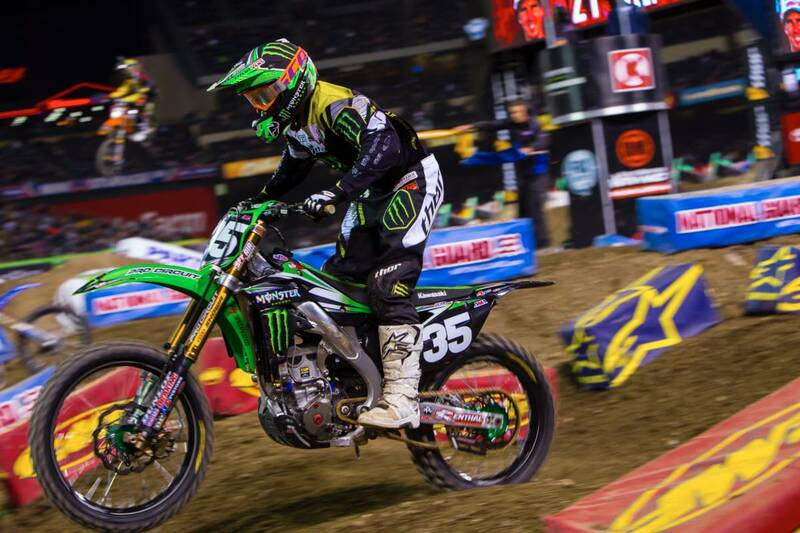 Two-time supercross champion and Kawasaki mounted Chad Reed powered his KX™450F to his 42nd career supercross win, and his first in nearly two years. 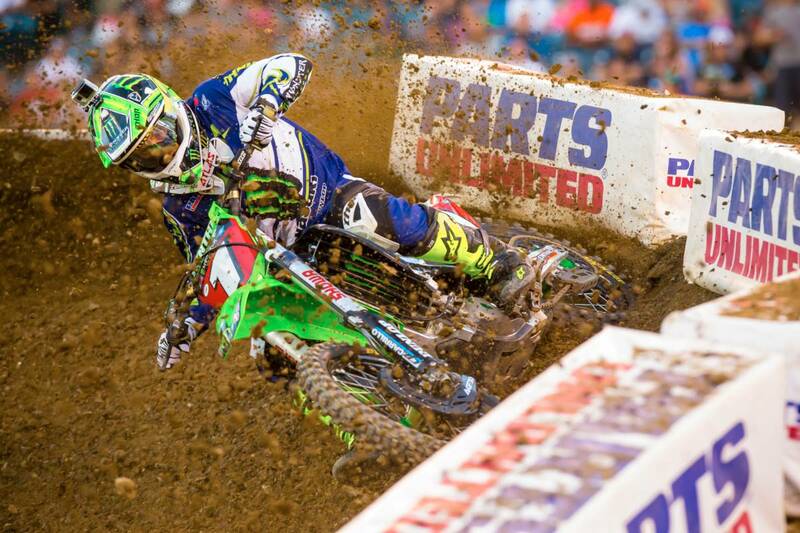 Monster Energy Kawasaki’s Ryan Villopoto worked his way into second place before a mistake dropped him to finish fifth. Jake Weimer charged to overcome a poor start and a late-race crash to finish 10th. Monster Energy/Pro Circuit/Kawasaki’s Justin Hill was consistently fast throughout the day and into the night program on the retro-theme course. Hill finished second behind his teammate in his heat race and went into the main event confident. His KX™250F rocketed out of the gate and nearly had the holeshot before his back end stepped out, sending him to the ground. From last position, Hill charged forward to finish an impressive fifth. Teammate Dean Wilson battled for pole position in qualifying for the third consecutive week and dominated his heat race. In the main event, Wilson was up front until he caught a tuff block and went down. He remounted to charge back to seventh place. Darryn Durham suffered a crash in practice and was forced to sit the night out. After Reed’s ninth place finish for Reed in Phoenix, the 2004 and 2007 supercross champion was looking to return to the podium. He battled forward to take the last qualifying spot in his heat race and looked consistent. 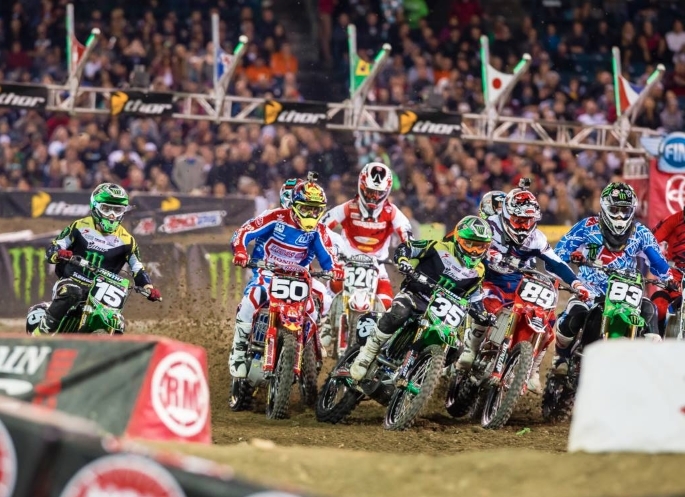 Reed jumped out to a top-10 start in the main event and progressively and quietly picked off riders until the last five laps. 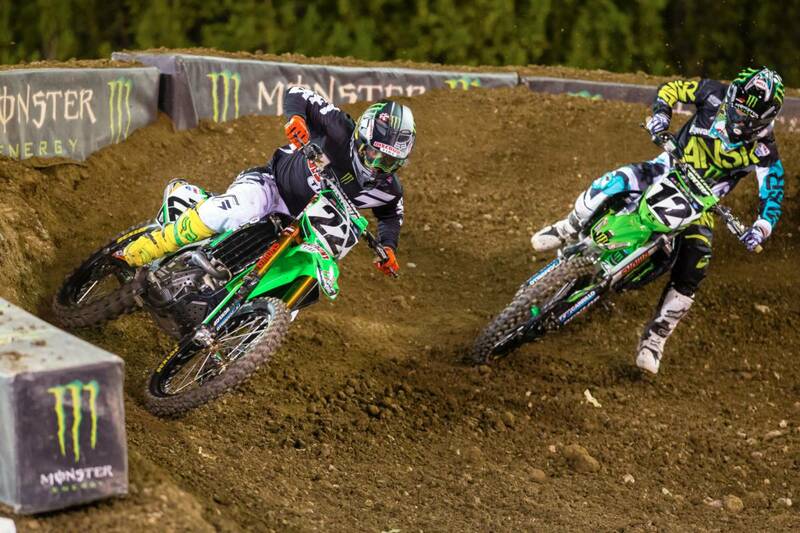 Reed began reeling in the leader and made a pass stick with three laps remaining to take his 42nd supercross victory. 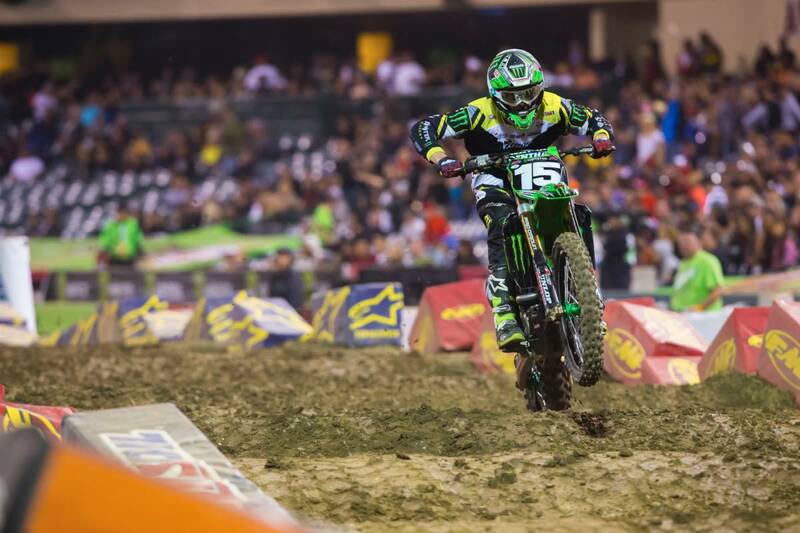 Villopoto returned to Anaheim with the red plates which signify the points leader. His heat race turned into a continuation of the main event from Phoenix as he battled with Justin Brayton, but settled for second place. The main event was looking to go his way and halfway through the 20-laps, the champ came in to pass for the lead. On his second attempt, slight contact resulted in Villopoto losing the front end. He remounted to finish fifth and sits one point out of the championship lead. 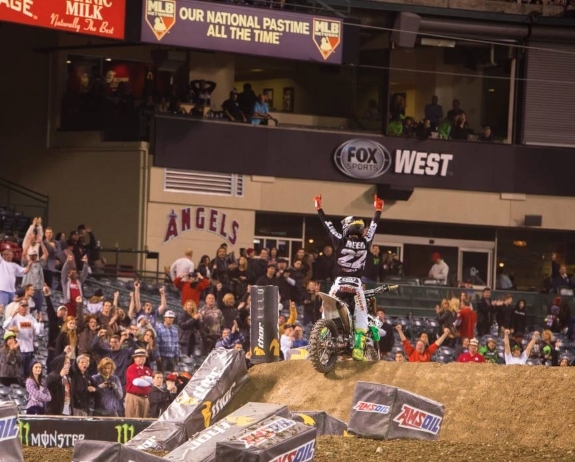 For Weimer, Hill, and Wilson it was a night of salvation. Weimer was pinched off rounding the first turn and had to come from 17th place on Lap 1 to finish a respectable 10th. While in the 250SX class, Hill had a similar story as his near holeshot quickly became last place as he lost control over the first jump. He charged through the entire 15-lap main event to post his first top-5 finish of the season in fifth. Wilson was in podium position early in the race before he crashed on his own. With his bike damaged, he pushed to collect as many points as possible and finished seventh. In honor of the 40th Anniversary of Supercross, the track design on Saturday was the Anaheim track from 2001. The riders commented the rhythms were a little different than how the current tracks are laid out but it provided a great racetrack and exciting racing all night long. Back in 2001, Ricky Carmichael rode his Kawasaki KX™250 to his first supercross championship and collected 13 straight wins. Many of the past supercross champions were on hand in Anaheim for the 40th Anniversary. 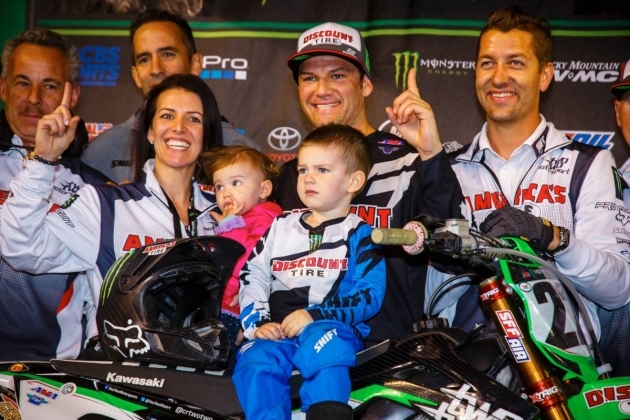 Past Kawasaki champions Jeff Ward, Jeff Emig, and Carmichael were on hand, as well as current competitors and past Kawasaki champions James Stewart and Villopoto. 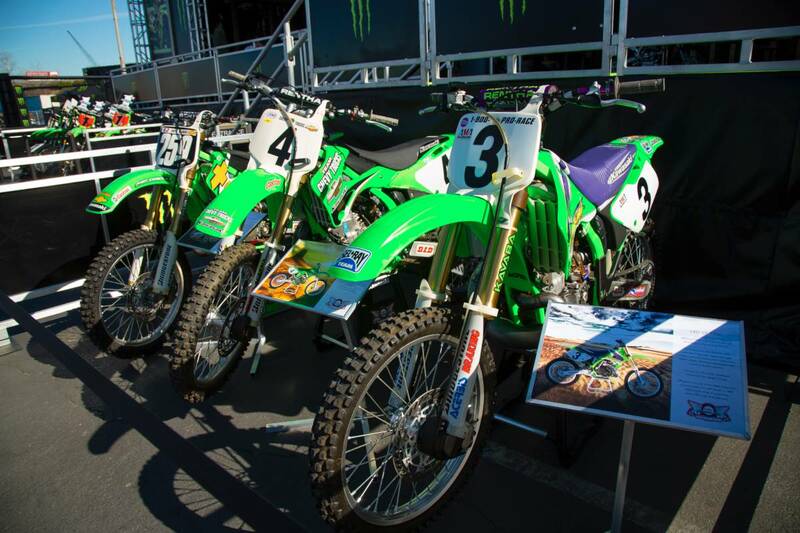 In the pits almost all of Kawasaki’s championship winning KX race bikes were on display, including many of Monster Energy/Pro Circuit/Kawasaki’s Regional 250SX championship bikes and Kawasaki’s first supercross championship bike from 1974. With three rounds completed, the series heads north to O.Co Coliseum in Oakland, Calif., the home of the Oakland Raiders on Saturday, Jan. 25th. Villopoto is just one point behind the championship leader, as he and the rest of the Kawasaki riders will look to return to the podium.